Kano State Government has called on Federal Government to declare Sabon Gari Market Fire as a national disaster in view of its magnitude and multiplier effects on the economy of the country. The called was made by the State Deputy Governor Prof Hafiz Abubakar when he received the Minister of Youth and Sports, Bar. Solomon Dalung in his office recently. He noted that Sabon Gari Market is a business hub that attracts people from all over Nigeria and beyond. The Deputy Governor emphasised the need for Federal government to take urgent steps towards assisting the victims. On youth development, Prof Hafiz Abubakar said Kano deserve special attention as 60% of state population are between the ages of 15 and 25 with 60 year old people accounting for only 15%. He told the minister that currently the total primary school pupils in the state is 3million with other 3million in Quranic and Islamiyya schools while more 3million are outside school. Prof Hafiz Abubakar disclosed that the state government has, with support of donor agencies, initiated some programmes toward achieving it's free and compulsory basic education to all children in the state. He then thanked the minister for his love and concern for the people of the state. 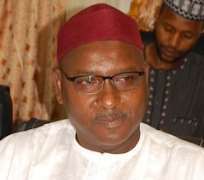 Earlier, the Minister Bar Solomon Dalung said he was in Kano to commiserate with the Government and people of Kano over the death of the mother of Governor Abdullahi Umar Ganduje and the Sabon Gari fire incident. He noted the the Sabon Gari Market fire affects many business people within and outside the state. The minister commended Kano State Government for its effort to ensure that the affected people gets succour within shortest time. He also noted government recent effort of ensuring religious harmony and tolerance among different religious groups in the state. Meanwhile the 9 man Sabon Gari Market traders committee set up by the government on recent fire disaster has submitted it's report. Submitting the report the secretary of the committee Alhaji Abdulkadir Bala Madigawa commended Governor Abdullahi Umar Ganduje for his government concern and efforts towards addressing the plight of the business community in the state. Responding the deputy governor assured them that all shop owners will be allowed to rebuild their places with guidance of egineers. While effor was on top gear towards resettlement of small traders at temporary sites. He charged them to hasten the compilation of names of the affected traders to enable government complete it's arrangements. Prof Hafiz Abubakar also assured them that will look into their recommendations with a view to implement them.